In the last two weeks, I have not published The Explainer. Most of my posts in The Explainer Series are full-length and in Q&A style. From today, most of my posts in this series will be short and will come in installments; I have seen it works best when we read important ideas relating to one crucial central idea in one short go and then refresh it with another one a few days later. So here's my first endeavor in this direction: a short Explainer of the U.S.-led War on Terror. 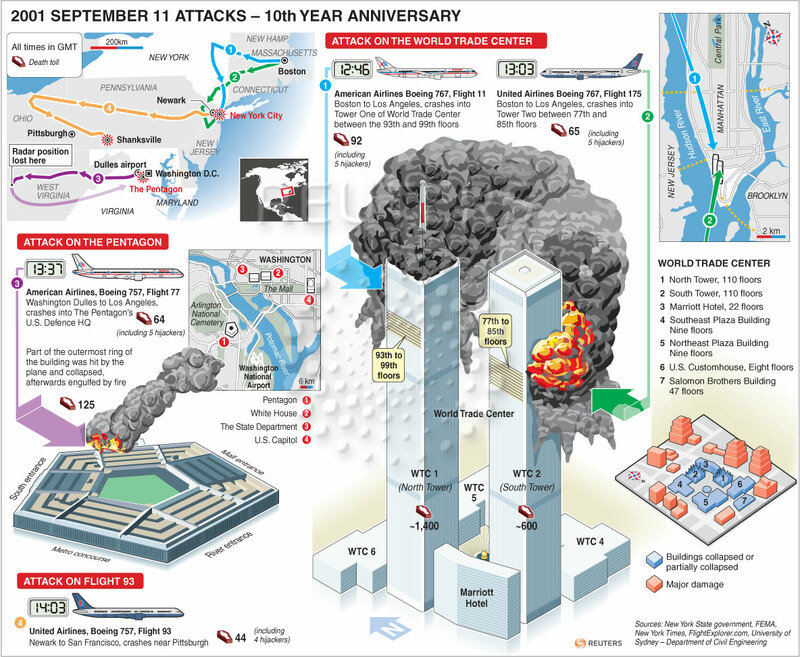 How did the 9/11 attacks unfold? I think rather than write any description of how the attacks unfolded on that unfortunate day, here's an infographic that's sourced from Reuters. The September 11 2001 attacks on American soil remain one of the most defining moments of our age. The attacks, in a way, shattered the myth that geographic isolation of the United States, flanked as it is by two massive oceans, would protect it from such large-scale terror attacks. About four weeks after the devastating terror attacks, the U.S. launched the War on Terror, with a dire warning for friends, foes and fence-sitters: ‘either you are with us or against us.’ It was not a solo effort from the U.S.; it involved several European governments, African nations (like Ethiopia and South Africa) and American allies elsewhere (like Australia and New Zealand). The term War of Terror was first used by the then U.S. President, George W. Bush; however, you should know that this is not the official term used for the worldwide anti-terror campaign. Rather the current U.S. government uses the staid legal term, Overseas Contingency Operation, to denote the War on Terror. The War on Terror uses not just military but also ideological, political and legal means to destroy and dismantle terror networks and regimes that lend support to such terrorist organizations. While the War on Terror’s main target was, and continues to be, Al-Qaeda, it has run disruptive operations against other terror networks, like the Lashkar-e-Toiba (LeT). Where is the War on Terror being fought? Ten years after it was launched, the War on Terror is being waged across the globe, with Asia as its main theatre. To put in perspective, major anti-terror operations are being carried out in Afghanistan, Pakistan, Central Asian nations (like Tajikistan and Uzbekistan), West Asia, and Africa (Somalia). However, the border areas along the Afghanistan-Pakistan boundary (called the Durand Line) have emerged as the Terrorism Central in the War on Terror. What is Rendition or Black Site? Rendition: This involves capturing terror suspects in different parts of the world and holding them without charge. Such operations are carried out by the U.S. anti-terror squads, belonging to the CIA, in collaboration with the local government in that part of the world. Black Sites: These are sites where the terror suspects are imprisoned. In short, these are detention centres (or jails) in pro-U.S. countries like Thailand, Romania, and Poland. However, since neither the U.S. government nor the local government acknowledges the existence of such sites, these are called Black Sites. Guantanamo Bay: This is an American naval enclave on the island of Cuba. It houses a massive U.S. naval base, with an infamous prison named Camp Delta. This prison is home to some of the world’s most dangerous terror suspects. Name a few major terror attacks after 9/11. Year - 2002; Place - Bali; Who carried out - Jemmah Islamiya, a local cell of Al-Qaeda; What happened - bombs detonated at two popular nightclubs, frequented by foreign tourists; How many died - 202. Year - 2003; Place - Baghdad; Who carried out - Al-Qaeda in Iraq; What happened - Truck laden with explosives rammed into UN headquarters; How many died - 19, including the UN Special Representative for Iraq, Sergio Vieira de Mello. Year - 2004; Place - Madrid; Who carried out - Not established, but Al-Qaeda suspected; What happened - 10 serial blasts on 4 trains; How many died - 191. Year - 2005; Place - London; Who carried out - British citizens, with links to Pak-based terror groups though group identity not established; What happened - 4 serial blasts on buses; How many died - 52. Year - 2007; Place - Algiers; Who carried out - Al-Qaeda in the Islamic Maghreb; What happened - suicide bombers run into UN building; How many died - 34. Year - 2008; Place - Mumbai; Who carried out - 10 Lashkar-e-Toiba terrorists, with links to Pakistan's ISI; What happened - Multiple attacks on high-value targets, like the Taj Mahal hotel and Trident hotel; How many died - 166. Year - 2010; Place - Kampala (Uganda); Who carried out - Al-Shabab, Somalia-based terror group, with links to Al-Qaeda; What happened - 2 blasts at one hotel and a club; How many died - 74. Repeated terror attacks have a numbing feeling; unfortunately they numb our mind and hence whenever any terror attack happens, all we do is to 'click our tongue - tch tch' and move on to an entertainment channel on the Idiot Box.